The uncertainty of what we don't know about our universe, once accepted, can lead us arbitrarily far. What we know about this chronicle: The narrator is John Densch, a frustrated husband, father and low-level technocrat who starts the whole ball rolling with a joke about a "bog monster." We meet his wife, Doreen, who wants so badly for John to move beyond the imaginary ensnaring him, but finds that everything comes with a price; Bollum, a voice in young John's head that told him tales of alien abduction and of a technological utopia for humanity, albeit one with an expiration date; and Derek, an abductee trapped on Bug World, at first a character in Bollum's tales, but in time an alternate existence for John. As John is jolted from one conflict to another, on earth and in his head, he encounters questions big and small about faith and self-reliance, meaning and trust. 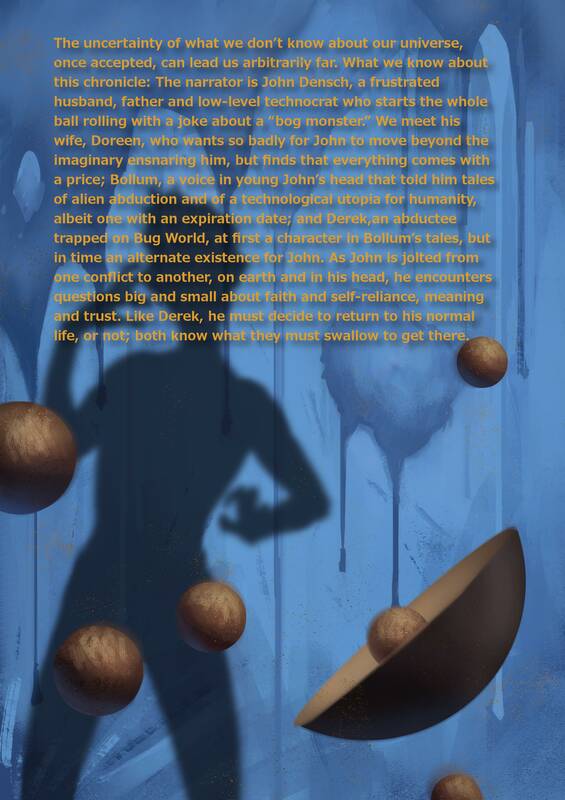 Like Derek, he must decide to return to his normal life, or not; both know what they must swallow to get there.